Both the Problot 12 and 12S Hybridization Ovens utilize the proven rotisserie method for hybridization. More than just a hybridization oven, the ProBlot 12S has a shaking mechanism built-in to the base, expanding its use to other applications. The rotisserie and incubation system in the ProBlot onens provides the perfect conditions for consistent results with low background. Mechanical convection circulates air through the chamber to create an extremely uniform environment , while heat input is controlled by a microprocessor. An integral viewing area in the door allows for sample visualization without disrupting the temperature. Speed of the rotisserie is variable and the axis is adjustable for setting the desired level of agitation. The rotisserie supplied with the ProBlot 12S accepts 35 mm diameter bottles as well as 50 ml tubes. 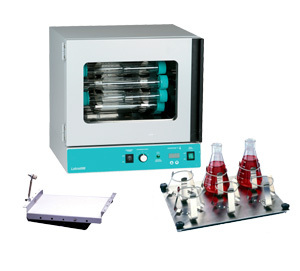 The integrated shaker in the ProBlot 12S has a n orbit of 10 mm and a maximum speed of 300rpm. Shaker operation is controlled by a 2 hour timer with a hold position. The standard shaking platform has a nonslip rubber mat for shaking plates , dishes and boxes. 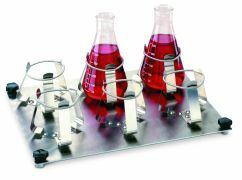 The flask platform, available separately, is supplied complete with 6 x 250 ml flask clamps. Customized platforms are available upon request. Interiors are corrosion resistant, mirrored stainless steel. The ovens are provided with a rotisserie that holds both 35 mm diameter bottles and 50 ml disposable tubes, a drip tray, two large bottles and a pack of hybridization mesh. 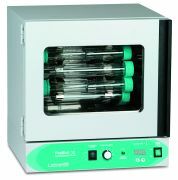 The ProBlot 12S is supplied with rotisserie, shaker base/drip tray, 2 large bottles and one pack of hybridization mesh. Available accessories include a rocking platform and shaker flask platform. Microprocessor control and mechanical convection provide an extremely precise and uniform temperature environment. This makes the hybridization system ideal for Northern and Southern blots as well as growth of cultures and other applications requiring tightly controlled incubations. ProBlot hybridization bottles are constructed of high quality borosilicate glass which meets or exceeds the requirements for Class I, Type A glass of ASTM 438. The glass has a low alkali content and a low coefficient of expansion. Heavy walled, the bottles block >95% of the beta emissions given off by 32P. The high temperature caps have a rugged Teflon seal for leak-proof performance, even after prolonged use. The seals fit tightly into the caps and will not fall out when the caps are removed from the bottles. Bottles, caps and seals are resistant to all common hybridization reagents, including PEG. br /> A variety of bottle sizes are available. Use of the proper sized bottle conserves valuable reagents and expensive probes. A convenient stand can be used for storing bottles upright when not in use. 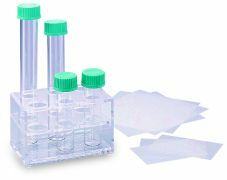 Hybridization mesh, used to separate stacked membranes and aid in the flow of hybridization solutions between them, prevents membrane to membrane contact in areas of overlap and assists in the handling of blots. Hybridization mesh is made of an inert material that cleans up easily. The mesh is available in convenient precut sheets and 40 yard rolls.